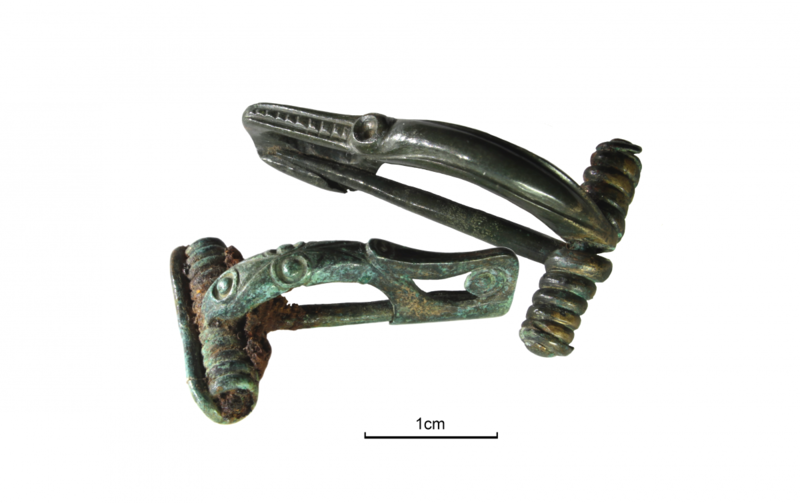 These two brooches date from the Middle to Late Iron Age and were recovered from a square barrow burial in Yorkshire. They were found with the body of a middle-aged female who was positioned with her hands clasped and her arms raised above her head. The individual was buried with the two brooches (pictured) and a selection of pig bones. The pig bones from this burial came from articulated animals, so it is likely that they were placed in the grave as a joint of meat. The practice of an individual being buried with the bones of a pig, or several pigs, is common in the Iron Age, and it has been suggested that this could be an indication of a higher status burial, as pig bones are often found in graves with “richer” grave goods. Square barrow burials are a type that can be defined by a small square ditched enclosure surrounding a central burial, which may have also been covered by a mound. They are typically Iron Age in date and this practice is thought to have lasted for around 400 years. Although Iron Age burials can be difficult to classify, as they differ regionally, this style of burial is seen frequently across Yorkshire. The two brooches are made of copper alloy and are highly decorated. The moulded decoration on the brooches has been designed to look as if it were cast in two pieces, but this is not the case. The whole brooch would have been cast as one piece, which gives it a thicker appearance. Brooches of this design are often found in burials and it is thought that they could have been used to clasp the fabric of a shroud or cloak that would have been wrapped around the individual at death. Highly decorated brooches like this could also have been worn as a form of ornamentation in life, not necessarily on clothing but perhaps clasped to a bag or other object.